Review by RR Gordon, author of the bestselling Gull Rock…You will be pleased to hear that Luke Delaney’s third novel in the Sean Corrigan series maintains the pace and suspense of the first two books. In this story Corrigan has the task of tracking down a missing four-year-old child who has been kidnapped – and then another child vanishes. What kind of monster is Corrigan hunting? And will he work it out in time to save the children?The Toy Taker takes you further info the past of the troubled yet brilliant detective and the development of the protagonist’s character only makes the story more impressive.Why are detective stories such a large, popular genre? Is there anything new to be told in this area? 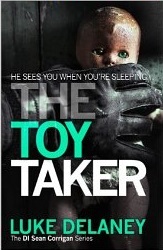 Maybe each individual facet of The Toy Taker has been covered before – there is nothing new under the sun, after all – but the author weaves them together in a vibrant, unsettling manner. In addition, Luke Delaney does have the advantage of being a former murder squad investigator so you know you are being given an authentic insight into the mind of a detective. This is a cracking thriller and a disturbing, yet page-turning read which is one of the leaders of its genre. Review by Jane Brown …This is a great debut crime novel, telling the disconcerting occurrences of a trip by four university friends. The aspects of this are relayed years later when the friends meet up again.The characters were depicted with reality and the story deals with emotions, pain and being able to look at themselves. 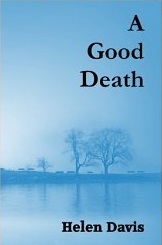 A Good Death has a new fresh feeling and an unusual story, well written by a really talented writer. The story changes to different time periods and it really was a rollercoaster of a read for me with an interesting description of Peru and climbing – and also visualising life at Cambridge University.I really could not put this book down, I was reading into the night wanting to find answers and get to the end. Just when I thought I knew what happened there was an unusual twist at the end which I was not expecting. This is an author who has written a fantastic first novel and will surely produce more great stories. I have already raved about this book to my colleagues and friends and will be closely following her forthcoming books. Review by Leslie Gardner …Maybe my expectations were too high but despite its intelligence, its verve and forward drive (I know, all good, good things), I felt a bit as if I were in a world where all the expected boxes for such thrillers or corruption were being ticked. Returning Dubliner, leaving an edge law firm behind in US where he was representing Mafia types, Ed Burke finds he has not left that underworld behind at all. And then an old girlfriend (okay she’s someone else’s wife) is killed .. things really kick off then.Naturally familiarity is in itself satisfying – and, yes, there were plenty of ‘surprises’, but I even sort of knew somewhere deep down that they were coming. In some ways this is of course the sign of a good storyteller when you feel you are in known territory (and so you are so much smarter than they are), and so it’s easy and pleasant to read – great escape even though people are being murdered and corrupted in little, tiny creeping ways.The central character, Edmund Burke (great name, and great conceit/device) is certainly a character who is worldly wise and i would be intrigued to follow another story of his – the ending of this one seemed pretty final (but I won’t give it away), but I note with pleasure that another one is on the way . 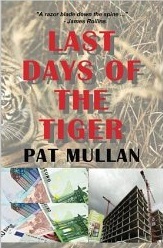 Altogether I am a signed-up fan of Mullan’s work now; maybe this is a slightly weaker one – but I’ll follow him again. 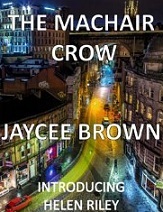 Review by Tim Adler …This first novel by Jaycee Brown has already been compared to books by Peter May such as The Black House because they are both set on the island of Lewis in the Outer Hebrides. However The Machair Crowlacks the brooding intensity of May’s work, which glowers like the sky over a Scottish mountain. Instead it’s a much more meat-and-potatoes thriller, more Tom Clancy than Georges Simenon atmospherics – and none the worse for it.Brown’s heroine Helen Riley is a Jane Bond/Ms Bourne type investigating the death of a government animal disease scientist on behalf of his widow. The authorities are covering up. What Riley finds out also provides payback for a tragedy from her own past — indeed, one of the satisfactions of this book is how Brown skilfully weaves Riley’s backstory as damaged goods into the narrative. We understand why she is the way she is.Brown has clearly done a lot of research into latest developments into weaponised technology from invisibility suits to remote control warfare, which is a pleasure to absorb. Any BBC Scotland TV producer reading this review should snap up the rights to The Machair Crow; it would make a perfect two-parter for a Sunday evening. And Brown himself looks as if he has a franchise on his hands.